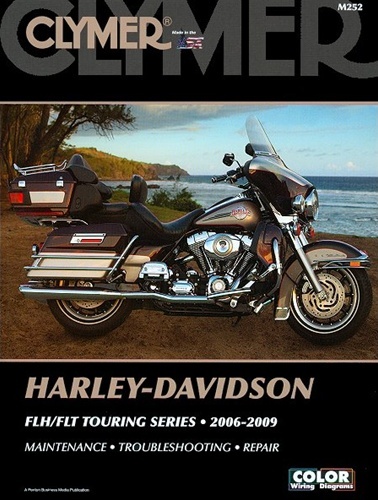 2006-2009 Harley Davidson FLH, FLT Touring Series Manual | Clymer | Free Online Shipping | Covering many models; Electra Glide, Screamin' Eagle, Road King, Road Glide Street Glide, Ultra Classic, and more! Buy this shop manual online today and get FREE SHIPPING. Buy the Harley Davidson manual for the Touring series and learn to perform every service and repair procedure on your Harley Davidson motorcycle. Clymer repair manuals are written for the do-it-yourself mechanic and the experienced pros. This service manual contains many original photographs, illustrations and wiring diagrams obtained from the complete teardown and rebuild of the Harley Davidson. This, in addition to extensive research is how Clymer repair manuals achieve an unmatched level of detail and accuracy. The manual includes complete color wiring diagrams and troubleshooting flow charts on an included cd. Engines: Twin Cam 88, 96, 103 and 110 cu.in. 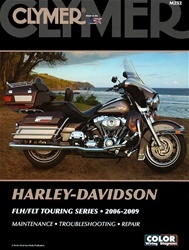 Use the "Buy Now" button at the top of this page to purchase the Harley Davidson FLH & FLT Manual.